Barry Hayles: Where next for 43-year-old former Fulham striker? 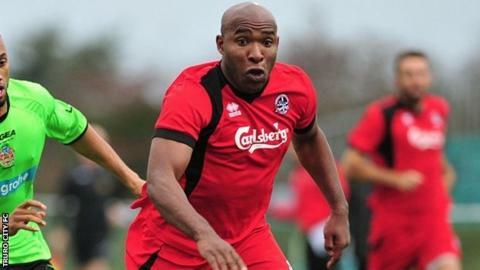 Former Fulham and Jamaica striker Barry Hayles has been released by Truro City after his third spell with the club. The non-league side's manager Steve Tully paid tribute to the 43-year-old, who helped them win the Southern Premier League play-offs last month. And after a 26-year career on the biggest, and smallest stages, he still has a lot to offer, according to Tully. "I'm sure he'll be out there playing somewhere because he's got the bug to play football," he told BBC Sport. Began career in 1989 at Willesden Hawkeye before joining Stevenage Borough in 1995, winning the Conference title in 1996. Hayles, who won 10 caps for Jamaica the last of which came in 2003, first joined the Cornish club in 2010 and twice helped them reach what is now the National League South. His time in Cornwall came at the end of a professional career which saw him win league titles with Fulham, have over £2m spent on him in transfer fees and play in all four leagues in England. But the London-based striker, who also played for Leicester City, Plymouth Argyle and Millwall, did not train with Truro, making a 550-mile round trip for Truro's home games, and that had a bearing on his future at the club. "We need people to be at training and he can't do that as he's away up in London and can't commit to training," Tully said. "This season we need to step up again and Barry understands that. "It wouldn't surprise me in a year or two's time that we clash in the managerial stakes because I know Baz wants to get into that side of it and we wish him all the best," added Tully.